American DJ is keeping a “low profile” at LDI 2012 – but only in terms of its fixture design. 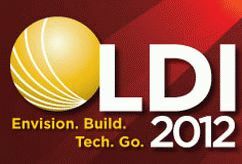 Everything else about the company’s display at LDI, held at the Las Vegas Convention Center October 18-21, is big, bold and brimming with pure lighting excitement. The company will be showing more fixtures that feature its exclusive low-profile, “sit-flat” design, which allows lighting units to be placed directly on the floor to address the growing trend toward uplighting. Amped-up brightness, more intense beams, and 2-in-1 fixtures that combine two different lighting effects into one unit are other highlights that will be featured at ADJ’s Booth #1309. Mega QA Par38 – A compact, low-profile, ultra-bright Quad-Color LED par, the Mega QA Par 38 will bring color and excitement to any uplighting, wall washing or stage lighting application. 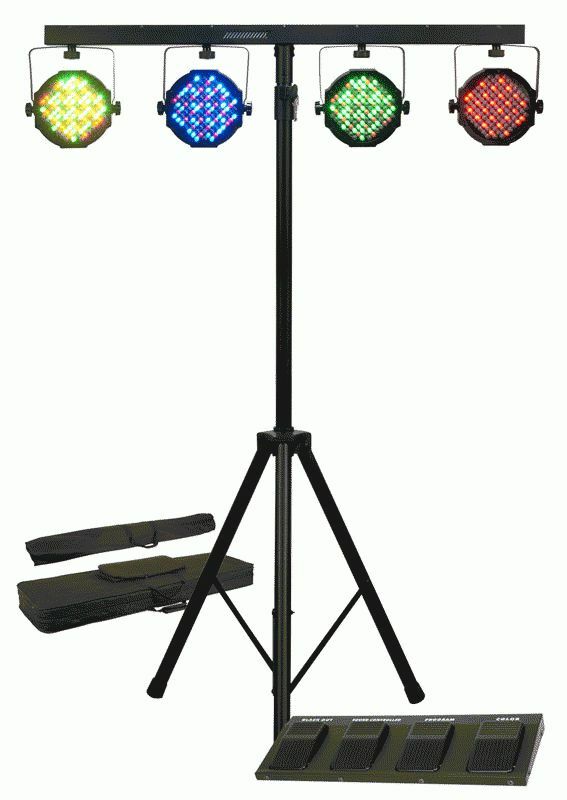 Powered by 3 x 5-watt 4-in-1 (red, green, blue & amber) LEDs, it provides super-smooth, shadow-free color mixing, while its unique sit-flat design allows it to be positioned directly on the floor for uplighting or placed inside truss without a hanging bracket. This is possible because the unit’s DMX and power Ins/Outs are located on the side of the unit, rather than the rear. Featuring 16 color macros, the Mega QA Par38 can be run manually or via sound activation to its own built-in programs, and it can be linked in multiples Master-Slave. 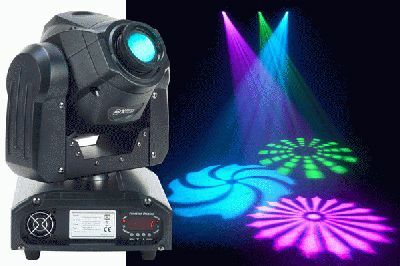 It can also be operated with a DMX controller, offering 8 DMX channel modes for a variety of programming options. Other features include a 25° beam angle; LED pulse and strobe effect; 0-100% electronic dimming; long-life 50,000-hour-rated LEDs; low 20-watt (maximum) energy consumption; and multi-voltage operation: AC 200V-240Vm 50/60 Hz. Jelly Par Profile -- A low-profile RGB LED wash fixture, the Jelly Par Profile comes in a transparent glowing case – making it 2-FX-in-1! Its 108 10mm LEDs (26 red, 46 green, 36 blue) produce vibrant color washes, while its unique see-through case is a dazzling jewel-like effect itself. 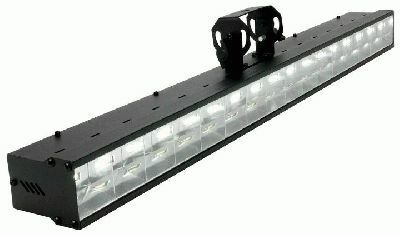 Great for uplighting, stage lighting, wall washing, mobile entertainers and special events, the Jelly Par Profile features an exclusive sit-flat design with its power and DMX connectors intelligently mounted on the side, not the rear, allowing it to be placed directly on the ground or inside truss without a bracket. 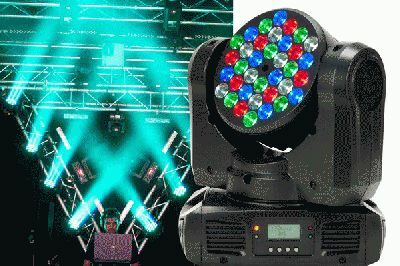 It features DMX or manual operation, sound active mode, 32 built-in color macros, fast or slow color changes, pulse/strobe effect, 0-100% electronic dimming. Linkable via 3-pin XLR, it includes IEC AC input/output to daisy chain power. Low-maintenance and energy efficient, its long-life LEDs are rated at 50,000ours and it has a 14W maximum power draw. FREQ 5 & FREQ 16 Strobe – These innovative LED-powered strobe lights are two FX in one: a traditional LED strobe and a 5-zone or 16-zone chase effect. The zone effect gives you the option to display the strobe bar either vertically or horizontally, and create a chasing white light for a truly dynamic visual show in the nightclub, on stage, or on the dance floor. Strobe speed, chase speed and dimming can be controlled either via DMX or manually. Both units can also be run in sound active mode to their own electrifying built-in programs. The FREQ 5 is equipped with five powerful 5-watt white LEDs and features a 5–zone chase effect, yet it consumes only 28 watts of electricity at maximum use. The larger FREQ 16 is powered by 16 5-watt white LEDs and features a 16-zone chase effect, while using only 91 watts maximum. X-Move LED 25R – Searching for a brighter beam? Look no farther than the X-Move LED 25R! This electrifying LED color/gobo moving head effect is twice as bright as its popular predecessor the X-Move LED Plus, thanks to the latest advancements in LED technology. Powered by a 25W white LED source, it comes loaded with professional features, including separate color and gobo wheels, 8 colors + white, 6 rotating gobos, gobo scroll mode, gobo shake effect, strobe/pulse effect, and exciting sound-activated built-in programs. The unit can also be operated via DMX, running on 9 channels, and it has the ability to be linked Master/Slave. 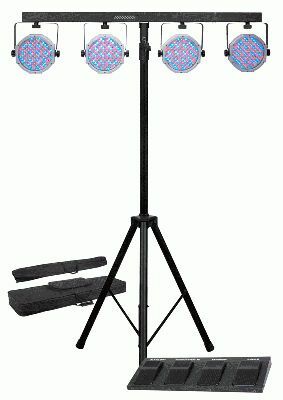 Small and lightweight, it’s extremely mobile and can be easily set up by any size entertainer. Its long-life LEDs are rated at 50,000 hours, it can be run all night without duty cycles, and it draws only 75 watts of power. Inno Color Beam 12 – Creating the intense, concentrated LED beam effect that’s so popular with today’s lighting designers, the Inno Color Beam will allow entertainers, nightclubs and stage productions to take their light shows to the next level. Its narrow 15° beam angle will “cut through” any background or wash effects with vivid, dramatic shafts of light. Powered by 12 high-quality CREE LEDs (3 red, 3 green, 3 blue and 3 white), this compact 36-watt fixture provides exceptionally smooth color mixing and is also stunning when used as an all-white effect. It can be run in DMX-512, Sound Active or Master/Slave modes and offers 0-100% dimming, 12 built-in color macros and a strobe/pulse effect.